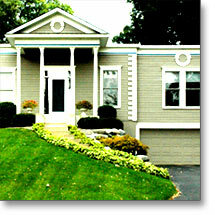 SJ Fisher Construction has the experience to help with any type of home addition or lower level remodel. 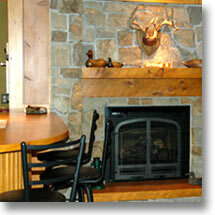 Whether you desire to add a great room, sunroom, mudroom or garage, we can service your needs. This charming lower level features knotty pine built-ins, a wet bar, and a gas fireplace all within the confines of a beautiful great room. In addition, there is a guest bedroom and a full bath with a glass block shower. 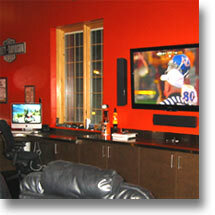 This man-cave is simply the most desirable garage in the Chanhassen Motorplex! With stainless steel wainscoting and the black and orange Harley motif, this garage features a kitchenette, a bathroom, a work area and a television viewing area complete with reclining theatre chairs. This Lake Minnetonka home was in need of extra space. The owner wanted to maintain the appeal of the former old school house while incorporating the additions into the original design of the home.